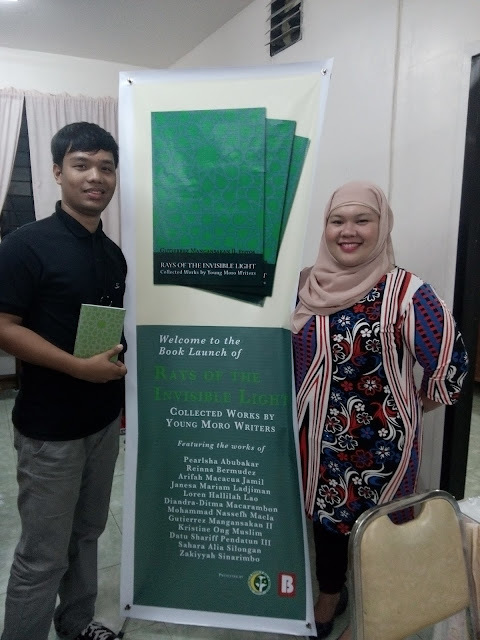 I met Arifah Macacua Jamilin in the book launch of Rays of the Invisible Light held last September 15, 2015, at ARMM Regional Library in Cotabato City. She is one of the amazing writers of the Moro Anthology who has a cool personality and unique perspective towards life. She is a modern Moro woman who is proud of her identity. In an interview via Facebook, Arifah talks about her piece – Sakeenah, and the role of Young Moro Writers in telling their own stories. Yadu Karu: Can you share with us a little bit about yourself? Where do you live? What do you do? AMJ: When asked where I live, I would tease that I have no permanent address. I am currently based in Manila. I work at the Senate for the Office of Senator Bongbong Marcos. Also, my hometown is in Malabang, Lanao del Sur but I was born in Quezon City and spent my first four years in Sampaloc, Manila with my parents. I went to college in Davao City while I completed my law degree in Cagayan de Oro City. YK: What's your inspiration for writing Sakeenah? AMJ: A part of my inspiration was a very close friend who was recently separated from her husband at the time while the entirety of it was inspired by everybody else back home in Malabang. YK: In Meranaw culture, how important to marry a relative? What's its implication? AMJ: Tradition dictates that we marry a relative as it somewhat gives the parents and families assurance that the married child is properly cared for compared to being married to a stranger wherein familiarity is yet to be cultivated. So basically the importance is honoring the wishes of one’s parents. Perhaps we can even call it convenience. May I say something about my parents—they are related to each other. Theirs is an arranged marriage although my father already liked my mother beforehand. It turned out very well for the two of them. However, my personal take on the matter is to marry for genuine feelings regardless of being related or not. YK: What's the reaction of the people after reading Sakeenah? AMJ: There were mixed reactions, mostly fond. Some of them said they were reminded of their failed marriages and that it was refreshing to see some parts of themselves in the story. YK: How does Maratabat important to Meranaw culture? AMJ: Maratabat is important in the sense that we do not let others belittle us or take advantage of our kindness. As maratabat is actually pride, there are times when it creates friction within and among friends, family, and strangers alike. Too much of it is not good. YK: In Sakeenah, the protagonist chose to stay in a place where her mother describes it as a "sinful place." Is it a form of escapism or contemplation? AMJ: It is a form of escapism for Sakeenah. She took off from the province and lived in a house different from the one where she comes from or from the ones in Montiya. She was “brave” enough to live in the said house and has respect for the landlady and her lover. Sakeenah only thought of her mother’s reaction and does not discriminate against them. She still pines for her husband so she does not contemplate on becoming a lesbian. YK: In your opinion, how important to encourage Moro Writers to write and share their stories? AMJ: So that we can preserve our culture and share our experiences with the rest of the country through the stories, poems, essays, and plays that we write. YK: After writing Sakeenah, what's next? AMJ: I may be focused on work at the moment and thinking of taking the bar exams but I hope to finally have the motivation to put in writing some new stories and essays, especially at this time when so many issues and heartwrenching news come up about and against the Muslim community in different parts of the globe. So I hope to write new stories and essays on the comings months. I met Arifah Macacua Jamilin in the book launch of Rays of the Invisible Light held last September 15, 2015 at ARMM Regional Library in Cotabato City. She is one of the amazing writers of the Moro Anthology who has a cool personality and unique perspective towards life. She is a modern Moro woman who is proud of her identity. In an interview via Facebook, Arifah talks about her piece – Sakeenah, and the role of Young Moro Writers in telling their own stories.